Can you picture the world without smartphones? A time when we used payphones on the side of the street or in the store? I can. It's 1990 and you're waiting for an important phone call- you have two choices which are to wait until you finally receive the call or have your answering machine record it to the cassette tape. Or you are out on the town and need to check in with the babysitter to make sure the kids are alright, so you search for the nearest payphone. You work at a large factory and your boss is looking for you, but it is very noisy and you don't hear the overhead speaker paging you, so your boss sends his secretary to walk around the building to find you. Lastly, you are on vacation and get lost. Hopefully, you have a map in your car or went to AAA to get the latest paper maps. These are examples of what life was like before smartphones were introduced. The way of life in today's society has changed due to the rapid increases in advances of technology and the introduction of smartphones. We have become a society of instantaneous contact therefore if people do not have contact with certain family members or friends on a consistent basis, he or she could feel the stress and pressure of the "un-known." Some situations that were acceptable prior to smartphones is not necessarily acceptable in today's society. Whether you're an eight year old, teenager, business man/woman, or parent, dependency exists on the easy access and the need to have a smartphone in hand at all times whether at home, work, or school. People go into panic mode if he or she were to leave the house without these technological devices. Some people describe leaving their smartphones at home as "feeling naked." Smartphones have become part of the everyday lives of everyone in society. Therefore, employers need to recognize this and utilize the benefits of smartphones and provide certain regulations when these devices are used too often where it negatively impacts the workplace. There are several types of distractions relating to smartphones which negatively influences and interrupts the focus of many employees. We have all been there- our smartphone screen lights up, vibrates or rings that is initiated from an incoming phone call, text message, or social media notification. This directly contributes to the distractions that exist which impacts the concentration level of an employee. It is close to impossible for an individual to ignore any notification, pointless or important, when he or she is in the workplace. It takes a lot of self-control to ignore notifications that do not require immediate attention. Employees can easily become preoccupied with personal conversations via texting or social media. It often will take more time for the employee to regain focus to continue his or her work related tasks. Research proves that it is easier to tune out a two-way conversation or another employee talking on the business phone compared to personal conversations conducted on smartphones. There was a scientific study done by the researchers at the University of San Diego testing the effects of smartphone vs. actual conversations (Walton, 2013). Veronica Galvan, who was a lead researcher in the experiment, states that smartphone conversations are more distracting to people than hearing a two-way conversation. In this generation, every employee owns a smartphone therefore this suggests that there are more distractions in the workplace today compared to earlier generations. Text messaging is the number one form of communication amongst smartphone users. This has influenced the way individuals in today's society communicate with one another. While at the workplace, texting can have a positive benefit of gaining quicker contact of other employees and clients but it can also interfere with the level of productivity if the amount of time spent texting is abused. Some employees can exceed the average amount of time spent texting throughout the work day, which can decrease productivity and concentration levels. There are daily situations that increase productivity and decrease the amount of time it takes for certain tasks to be completed in the workplace. Employees and clients can send notifications and updates more quickly than an email. An email requires an individual to be logged into his or her email account compared to a text message that is sent directly to a phone number and does not require that extra step of "logging-in." A date or time change for a meeting or conference call can be texted directly to the individual to save time and allow everyone involved to know immediately. This can be helpful for individuals who have unpredictable work schedules or have last minute meetings that are scheduled at the convenience of clients and customers. Reminders can be set for important conference calls or meetings, which would send a notification directly to the smartphone usually fifteen minutes prior. When productivity increases, it drastically impacts the ability to multi-task to complete more responsibilities and meet all deadlines appropriately. Convenience is a crucial aspect that all organizations and firms look to obtain for their employees. Smartphones provide the ability for employees and clients to communicate and contact one another quickly and efficiently. Before smartphones were introduced, contacting other customers and clients on their office phone and dealing with automated systems was considered the "norm." In today's society, that is almost unheard of since it is easier and more convenient to connect with another client on his or her smartphone since these devices are so readily available. If an individual does not respond to a simple text message, e-mail, or phone call within a certain period of time, this individual can be considered "rude" for potentially ignoring the notification on his or her smartphone. Conflicts are resolved faster when smartphones are a possible form of communication. Timely phone systems or secretaries can transfer errors or miscommunications to upper management or other employees who receive a message while he or she is away from their desk. Contacting a personal smartphone and avoiding the "middleman" between employees and clients can increase the personal feeling amongst the company and its employees (Chron Small Business) Contacting an individual on their personal smartphone can increase the probability that an urgent message regarding a meeting that day or even the next hour is received on time. 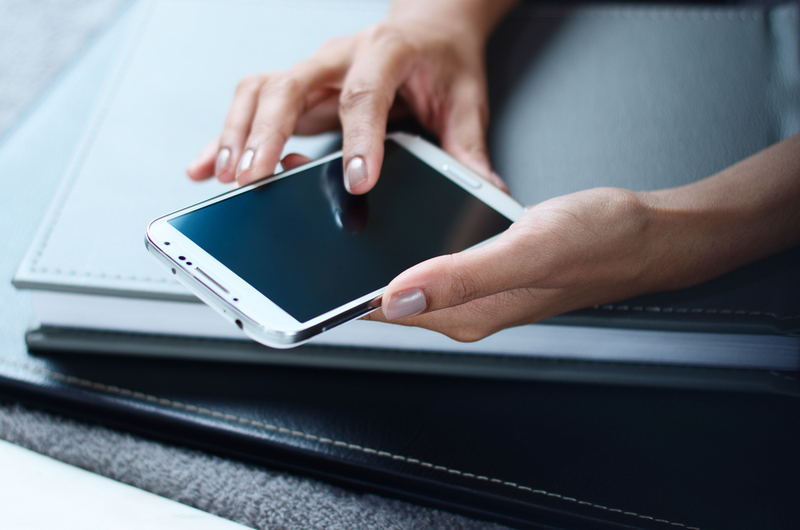 According to the University of Kansas study "Smartphone Micro-breaks During Work Day are Productive," employees should be given a few short breaks throughout the day. This has proven an increase in productivity and more deadlines being met before or on time. These mini-breaks throughout the day allow employees to take their minds off any potential work stress and "refresh" his or her mind. The University of Kansas study says "workers who use their phones for short breaks throughout the day tend to be happier and have a more positive attitude." According to this study, employees spend an average of 22 minutes per eight-hour work day on his or her personal phone. This statistic is approximately three minutes each hour. Communication is extremely important in order to prevent any misconstruing or misinterpretations in the workplace amongst employees, management, HR professionals and clients. Face-to-face interactions have diminished a great deal due to the rapid increase in smartphones. There has been a limitation placed on personal relationships with employees, management and clients by relying solely on technology. According to the resource, The Negative Effects of Cellphones (2013) "relationships in the real world are affected when they are substituted for electronic ones". People in today's society have become accustomed to communicating daily through text messaging, e-mailing, and social media since it is convenient and a quick way of connecting with others. This has a downfall to it considering no one bothers to pay attention to the people around them. This affects performance, alters relationships, and decreases networking and making business connections with others. Smartphones have become a major distraction in the workplace, which is a main issue that affects the quality of an employee's work and his or her concentration level. According to a study from Carnegie Mellon University's Human-Computer Interaction Lab, "researchers found that the average office worker gets about 11 minutes in between each interruption, but takes about 25 minutes to return to completing the original task after each interruption" ("The Negative Effects of Cellphones," 2013). Networking and making connections is extremely important in the business world today. Long-lasting relationships develop from in-person contact. Even though technology makes it easier to stay connected, this has been negated by making it difficult to begin and maintain relationships without the personal interaction. The interpretation of messages and the meaning behind the way certain words are typed and perceived has been drastically changed due to the consistent daily use of smartphones and similar technological devices. Facial expressions and personal interaction play a huge role in defining how an individual feels about something. The way an individual would text or email a personal friend verse a client could be completely different. "Have a great day!" or "Have a great day." could be interpreted differently when typing an email to a client. A friendlier vibe is given with the exclamation point opposed to the period. In both instances, the employee could have meant "Have a great day" in a heartwarming, friendly way but the punctuation can alter how this is interpreted. There are certain policies and procedures that can be issued based on the usage of smartphones and other similar devices in the workplace. Some options are: a zero-tolerance policy, case-by-case, break-time only, or a reasonable use policy. In an article written by Rebecca Mazin from AllBusiness.com, she believes that the best way to go about "electronics communications policy" is to structure it around the organization's corporate culture. Depending on the size of the company and its corresponding culture, certain policies and procedures could be more or less appropriate. Selecting a policy that is not structured around the organization's culture can cause risk and negative effects on employee morale and productivity.